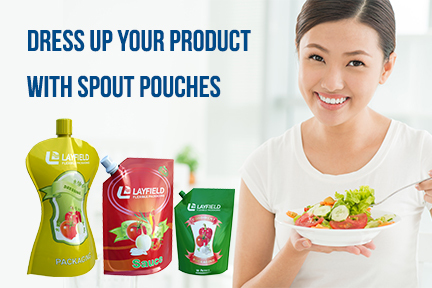 With new innovative packaging solutions more and more food manufacturers are switching to the stand up pouch with spouts due to special spout designs that are easy to open and pour yet prevents the products from spilling out. These packages are highly visible due to the high definition printing capabilities . You can also lower your packaging costs as these packages uses up to 33 times less materials when compared to rigid or glass containers. Layfield has saved customers anywhere up to 40% off their packaging costs.